Researchers at the University of Geneva proposed a novel approach to optically ‘pump’ carriers valley-selectively using a high-purity bismuth crystal. In bismuth there are three valleys and the electrons orbit in magnetic field that are strongly elongated along one direction due the interaction with the atomic lattice. Each valley has its own direction - which means that the direction can be used to discriminate between the valleys. 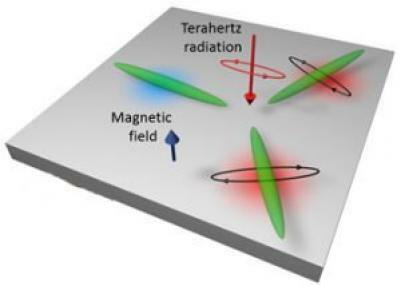 The researchers say that using an elliptically polarized terahertz radiation, where the ellipse elongation matches the shape of the electron orbit, one can selectively excite electrons in different valleys. Switching between the valleys can be achieved by simply rotating the ellipse.